How does Qualcomm’s SenseID fingerprint scanner work? Ultrasonic, subsurface, and a whole host of details. 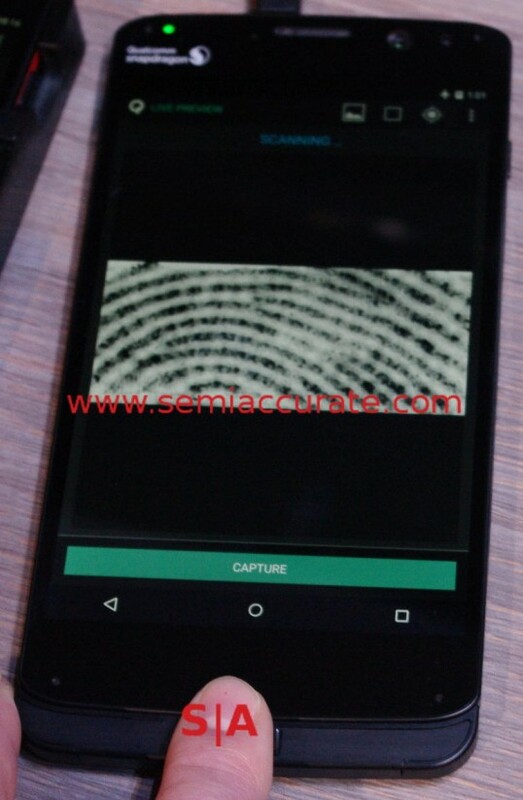 SemiAccurate told you about Qualcomm’s SenseID ultrasonic fingerprint reader earlier, let’s go a bit deeper. As you will see, this new tech is actually quite different in both how it works and what it returns. At its core, Qualcomm’s SenseID technology just reads fingerprints like several other technologies in wide use. If you peel away the top layers you will see that it is quite different is both functionality and data returned. Luckily for Qualcomm, different in this case is a synonym for better, SenseID could end up being much better than traditional methods. Look ma, a pic of my fingerprint! The heart of the tech is an ultrasonic wave generator and sensor, it makes sound waves and reads the echoes. If you are familiar with sonar the same rough ideas are taken to a new level of detail. Qualcomm would not talk about the details underlying these parts of the process but when they do the phrase piezo is likely to be heard a lot. When using SenseID the first thing you notice is that it isn’t a traditional swipe sensor, it is just a touch. Press your finger to the sensor area and your fingerprint is read off like magic. OK, maybe this kind of sensing isn’t magic anymore but it does work well and is far less fussy than the swipe readers. More important is that he sensor isn’t actually a sensor, although there is a marked area in the demo pictured above, there doesn’t have to be. Traditional fingerprint sensors have to expose the sensor itself to the skin leaving it quite vulnerable to static “*crack*.. Ow!…damnit why doesn’t this $*&(%ing thing log me in” type events. SenseID on the other hand can be under the phone’s screen, glass, or other surfaces happily protected from such shocking events. Since it uses ultrasonic waves anything stiff enough to transmit sound will work just fine for SenseID. Glass and metal are obvious candidates but even plastic without voids will work, you can read through quite a few substances. Better yet things like lotion, sweat, or moisture actually help the process, they transmit sound far better than air. When phone designers make devices with SenseID, they can now put them in shielded and waterproof locations, quite a boon for warranty calls and the like. The image returned is not just a 2D picture of your fingerprint however, it can also read depth. This ‘3D’ image can read things like sweat glands, cavities, and even a few sub-surface structures. If used properly this can give a more secure and harder to spoof reading, at least in theory. Qualcomm says it can also distinguish between live and political, I mean non-living fingers but won’t say how. If it can read sub-surface features, that bit isn’t exactly rocket science though.